Definitely a nice effect. Not much to say really, its good in a Mi-go deck, not good otherwise. 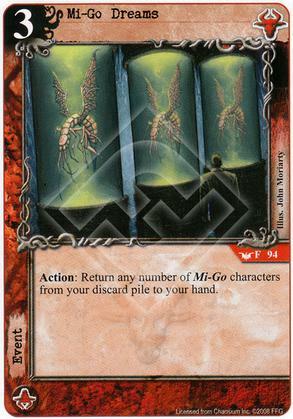 A great effect for a specific deck, if you are running a mi-go deck you will want to include this. Even if playing a Mi-Go deck, I would make it night and use Dark Rebirth instead. There is no synergy between night and mi-go so you need to shoehorn the additional subtype into a deck. If you were going to run night anyway then dark rebirth may be a better choice, especially in a duel faction deck. I'd rather run the simple combo of plague stone + mi-go dreams. I was thinking savio corvi should be good in a mi-go deck to give them terror in addition to mi-go skull in case that gets removed with plague stone or something else.